Anne Jones has reportedly received Sir Ken Dodd’s entire £27.5 million fortune, in spite of the fact he didn’t leave a will. According to The Sun, if they had not married, approximately £11 million would have been payable in inheritance tax. Express.co.uk has contacted a representative for Sir Ken’s estate asking for comment. After he died, the Liverpool legend’s partner of 40 years opened up about their relationship in a BBC documentary about his life, saying: “We’d always said we’d get married at some time. “Apparently he was talking to our vicar and asked if there was a way it could be done privately, very quietly,” she continued. “Julia Jesson, the vicar, came over and friends Peter and Colette and two registrars. “Licenses were, done, whatever paperwork was filled. “Somehow it happened,” Anne recalled. “He said his vows and I was saying my vows. It was a normal wedding ceremony. Hargreaves Lansdown personal finance analyst Sarah Coles previously told Express.co.uk how the marriage meant Sir Ken’s fortune was not liable for inheritance tax. SIR KENN DODD WIFE: WHO IS ANNE JONES? DID THEY HAVE ANY CHILDREN? Had the couple not been married before the comedian died, the majority of his fortune would have been diminished by a 40 per cent inheritance tax. “It addition to the enormous emotional resonance a wedding carries, there are also tremendous differences between the ways a partner and a spouse are treated when it comes to inheritance tax,” she said. In 1989, Sir Ken faced trial for tax fraud after £300,000 in cash was discovered in his loft and was cleared of all eight charges. The charges covered the period of 15 years and the court heard how the funny man had 20 bank accounts in Jersey and the Isle of Man, travelling abroad to deposit money there. 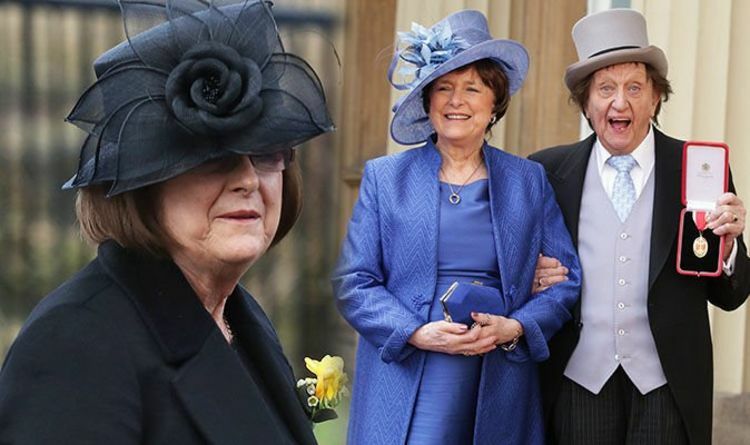 Anne and Sir Ken first started dating in 1977, after his long-term partner Anita Boutin died of a brain tumour. His future wife had performed alongside him in his shows as Miss Sybie Jones and is a former Bluebell dancer. Sir Ken, who was knighted in the 2017 New Year Honours list for his services to entertainment and charity, died last March less than two weeks after being discharged from hospital following a chest infection. Hundreds lined the streets of Liverpool to pay tribute to the comedian, with stars including Jimmy Tarbuck and Les Dennis joining those celebrating his life at a ceremony at the Anglican Cathedral.